Information related to employees working in central government, state government and autonomous organisations in India. i) The Government of India, Ministry of Finance, Department of Expenditure vide The Gazette Of India, Extraordinary Pt-I, Sec-I dated 29/08/2008 published the Government Resolution related to the 6th Pay Commission Report. Para 2 of the said resolution states, “The Commission’s recommendations and Government Decision thereon with regard to revised Scales of Pay and Dearness Allowance for civilian employees of the Central Government and personnel of All India Services as detailed in the Part-A of the Annex-I will be made effective from 1st day of January, 2006”. Hence, as already decided in the Government resolution dated 29/08/2008 cited above, the effective date of its implementation is w.e.f. 01/01/2006. There is also no delegation of power conferred on anybody to either to amend or modify or change the above decision of the Government on MACP, since it is very clear and complete in itself and there is no room for any doubt or interpretation. iv. … when the Government had already fixed the effective date, and did not delegate any power to anybody, changing the effective date by an Officer in the Ministry at the level of Dy. Secretary to the Government of India is without any legal validity and liable for disciplinary action for making such a colossal mistake and thereby making inconvenience and heavy financial loss to many of the employees not only in the Central Government but State Governments and Autonomous Bodies who adopt the Central Pay Commission. v. ….immediately after the issue of the said Office Memorandum dated 19/05/2009, various staff unions demanded the effective date from 01/01/2006 through the National Anomaly Committee (NAC). The demand was rejected as per Office Memorandum No.11/1/2010-JCA dated 06/10/2010. vi. ….. Petitioner, thereafter made a representation dated 26/11/2010 against the rejection. The staff unions also raised the same issue again before the NAC. However, the demand was finally rejected vide OM NO.11/2/2008-JCA dated 13/09/2012 annexed. Hence the Applicant had filed the Original Application no.145 of 2013 before the CAT in his personal capacity based on his representation. vii. …the Learned CAT dismissed the application, by its order dated 16/04/2013, thereby approving such a Himalayan blunder committed by the ministry officials. iv. The Learned CAT Bombay Bench headed and dominated by the Administrative member was totally prejudiced against the Petitioner in pointing out such a devastating mistake committed by people from the same service and failed to consider the evidence on the face of the record. ix. The Learned CAT was totally wrong in holding that the MACP Scheme became operative not w.e.f.01/01/2006 but with effect from 01/09/2008. It is very clear that the date of the scheme is w..e.f. 01/01/2006 as explained in para 2 above. Hence there is no room for any doubt or interpretation in this regard. However, the Learned CAT held in the reverse only for the purpose to bail out the Officers in the DOPT under whom it functions, from the responsibility of making such Himalayan blunder thereby many employees not only in Central Government but State Governments and Autonomous Bodies who follow the Central Pay Commission. x. The Learned CAT was also wrong in assuming that there was a small concession was recommended for those government who retired between the period 01/01/2006 to 31/08/2008 on the consideration their number would be small and not everyone retiring during the interregnum would be a case of stagnated promotions and hence eligible for 3rd promotion. This is purely a fictional story made by the Officers of the 1st Respondent, DOPT copied and pasted by the Learned CAT without applying its mind and neither substantiated by any facts nor covered anywhere in the decision of the Government conveyed through the Government Resolution gazette notified by the Finance Ministry, the 2nd Respondent. The Government Decision is absolute and applicable to all employees in service as on 01/01/2006 as already explained in para 2 above. xi. ..the Learned CAT in para 6 of its judgment wrongly and with mala-fide intension stated that the ACP Scheme figures as Paragraph 4 of Column 3 of the Government Resolution. In reality, it is not a Pragraph but item no.4 of part- A of Annexure-I which is accepted by the Government with effect from 01/01/2006 in clear terms vide para 2 of the Government Resolution quoted by the Learned CAT in para 4 of its judgment itself. But in 6 it was misquoted with the sole intention of bailing out the Officers of the 1st Respondent from such a grave mistake committed by going against the decision of the principal employer i.e., the Government of India, for which they should be charge sheeted and thrown out of service. Dearness Allowance will be effective from 01/09/2008. Obviously, the same is included in Part-A of Annexure – I”. Actually, other allowances whose effective date is fixed by the Government w.e.f. 01/09/2008 is covered by para 3 of the Resolution and Part B of Annexure-I and not Part A as observed by the Learned CAT, though it is patently clear on the face of the record. On the other hand, MACP is very clearly and beyond any doubt appearing in Para 2, Part A of Annexure – I for which effective date is already fixed by the Government w.e.f.01/01/2006. Therefore, it is very much clear that, this wrong observation is made by the Learned CAT due to an over enthusiasm to bail out the DOPT Officers from the responsibility for taking action against the decision of the Government with the full knowledge that it is wrong rather than upholding the law and truth. This is never expected from a judicial authority. xiii. …the Learned CAT, in para 8 of its judgment is making a bundle of lies without any basis. Firstly, it stated that the guidelines are flowing from the fountain-head of DOPT. It is totally untrue. There is no authority pointed out by the Learned CAT. It is based on presumptions and assumptions. In fact, even the Government Resolution, which is the source of financial effect was issued through the Finance Ministry and not through the said DOPT. Second untruth is that, all the Government employees including the applicant received the financial benefit under MACP Scheme in pursuance of the said OM dated 19.05.2009, whereby the Scheme of MACP was made effective from 01.09.2008. Third untruth is that, financial up gradation as per the provisions of earlier ACP Scheme was granted till 31.08.2008. The so called Scheme itself is a fraudulent/fictional story created by the said DOPT with ulterior motives, and copied and pasted by the Learned CAT in its judgment. The truth is already stated in para 2 herein above and no need to repeat it. In accordance with item 4 of part A of Annexure-I, read with para 2 of the Government Resolution issued through the 2nd Respondent, Government of India in its Constitutional power under Article 309, decided the Scheme modifying the Recommendation of the 6th CPC and fixing the effective date as 01.01.2006. The said DOPT,1st Respondent, without any authority or delegation of power changed this decision of the Government of India to 01/09/2008 in the disguise of the said Scheme probably to benefit some powerful Officers of the DOPT who may not be eligible if the MACP was implement as decided by the Government from 01/01/2006. Otherwise, there is no visible reason behind this amendment of the Government decision by some Officers in the DOPT and the Learned CAT going after this fiction created by the DOPT rather than the facts and law supported by records annexed with the Application by the Petitioner. xiv. …what Is stated by the Learned CAT in para 9 is out of context since the issue is the competence of the DOPT Officers to change the Government Decision taken under Art.309 of the Constitution of India without any delegation of power from a competent authority. The entire theory of benefit to certain employees due to the illegal amendment of the effective date from 01/01/2006 as fixed by the Government to 01/09/2008 by the said O.M. issued by the DOPT, is a fiction not supported by any facts or law. Probably some powerful Officers may be the beneficiaries for whom the entire system was misused and forced the staff side to agree with them, though it is altogether illegal and unconstitutional. That may be the reason why the Learned CAT also reached a wrong conclusion that the Government Resolution made under the Constitutional Powers and Gazette notified by the Finance Ministry can be amended to a different date by the Officers of DOPT which is in another Ministry, that too without any delegation of power to change the effective date of MACPS. It is also a perverted and wrong decision and says that an unconstitutional action can be made constitutional and legal by mere consent of parties who have no power to do so. If this perverted view of the Learned CAT is accepted, it would make a catastrophic effect in the legal system that by consent of two parties, the Indian Constitution could also be amended by these Officers for their personal benefit citing this Judgment of the Learned CAT as precedent. Therefore, this illegal amendment is made by the DOPT, i.e., the 1st Respondent, without any authority of law, and support of facts. It is merely a fictional statement that some otherwise ineligible employees may be adversely affected by the reversal against the loss of many eligible employees, had the Government decision is implemented. Therefore, acceptance of the said invalid and unreasonable argument by the Learned CAT is perverted, discriminatory, with ulterior motives, unreasonable, beyond commonsense and thus violative of Art. 14 and 16 of the Constitution of India. It is also against the basic principles of Administrative Law. xv. …in para 11 of the judgement, the Learned CAT, again with malicious, and mala-fide intentions, suo motto, argue for the 1st Respondent as if their advocates, that though the Petitioner had challenged the competence of DOPT to issue the OM declaring date of effect of M.A.C.P benefit, neither the staff side nor the Union ever raised this question before subjecting themselves to the Joint Meeting that DOPT did not have any authority to declare the date of effect of MACP Scheme. This has no relation with the case before the Learned CAT filed by the Petitioner who had challenged the competence of DOPT as admitted by the Learned CAT. It is also a fact that the Staff side/Union had demanded the effective date from 01/01/2006. After all, they were attending a joint meeting of officials and not arguing before the High Court or Supreme Court engaging constitutional experts. Therefore, it was not a material connected with the Petitioner’s personal Application before the Learned CAT. It cannot be worth enough to be considered as a childish argument, but a totally perverted, unrelated and unreasonable argument with ulterior motives similar to saying, before Newton’s Theory of Gravity, not only apple, but other fruits and even coconuts were falling down, but nobody had ever raised this point and hence cannot be accepted. xvi. ….in 12th Para of the judgment, whatever stated by the Learned CAT is totally untrue. First of all there is no complexity in the Government decision. It is very clear and unambiguous to read para 2 of the Government resolution as stated herein above. All the mess was artificially created by the DOPT Officers with ulterior motives to change the effective date from 01/01/2006 as decided by the Government in its Resolution to 01/09/2008. Otherwise, there was no need for any meeting or any agenda or anything. This is also irrelevant to the issue, since the very validity of the said O.M. and the competence of the DOPT Officers to change the effective date without any authority of law, is under challenge. All these unrelated things are stated herein the judgment is also with an intention to fish in the troubled water i.e., to bail out the DOPT Officers, by hook or by crook, from their penal responsibility for going against their employer’s decision of fixing the effective date on 01/01/2006 by changing it to 01/09/2008 without any authority, whatsoever nature. xvii. That, the statement of the Learned CAT in para 13 of the Judgment that, the MACP benefits have already been implemented – with effect from 01/09/2008 vide O. M. of DOPT dated 19/05/2009 is totally false and untruth. In reality it was implemented by the Government Resolution, GOI., MIN. OF FIN. NO. 1/1/2008-1 C dated the 29th August, 2008 annexed as Ex.C. It is also untrue and false that MACP is coming under any other allowances. MACP is coming specifically under item no. 4 of part A of annexure I read with para 2 of the Government Resolution which were made effective from 01/01/2006. Whereas allowances other than dearness allowance, would be effective from 01/09/2008 in accordance with para 3 of the Government Resolution and covered under Part B of Annexure – I. The role of DOPT is only a consultancy for those items not covered in the Resolution, vide para 7 of the Government Resolution. Since the MACP is specifically mentioned in item no.4 of part A of Annexure – I, of the Government Resolution, DOPT do not have even the consultancy power. Then there is no question of power for changing the date already fixed by the Government in the Resolution. However, the Learned CAT is mixing part A of Annexure – I mentioned in Para 2 and Part B of Annexure – I of para 3 of the Government Resolution with a view to make a room for interpretation and thus to bail out the DOPT Officers from their culpable responsibility of changing the effective date fixed by the Government to suit their interests. Therefore, this is a cold blooded MURDER OF JUSTICE by the GUARDIAN OF JUSTICE i.e., the Learned CAT which should be treated as misuse of judicial process and to be treated as Contempt of Court and action should be initiated to stop such malpractices. xviii. That, by going out of the way in manipulating the facts as stated above, the Learned CAT is now trying to fit in para 14 of the judgment a Supreme Court judgment in the following words, “It has further been held in the case of Chandrashekar A.K. Vs. State of Kerala ( AIR 2009 SC 643 ) that revision of pay scale is essentially a policy decision, Recommendations relating to revision of pay scale requires its acceptance by the employer or the State which has ultimately to bear the financial burden.” This case is totally fitting to the Petitioner’s case in favour and not against. The recommendations relating to the MACP was already accepted by the Government of India i.e., the Employer, with certain modifications with effect from 01/01/2006 vide para 2 of the Government Resolution dated 29/08/2008. The Petitioner is not at all objecting to the Government resolution, but to the O.M. DATED 19/05/2009 issued by one of the many departments i.e., DOPT of the employer and going against the decision of the employer. Therefore, the above case is very well supporting the case of the Petitioner and not against it. However, importing an alien and unknown reason, and contradictory to the Prayers of the Petitioner quoted in para 1 of its own judgment annexed as Ex.A, the Learned CAT wrongly held that it is not the case of the Petitioner. i. 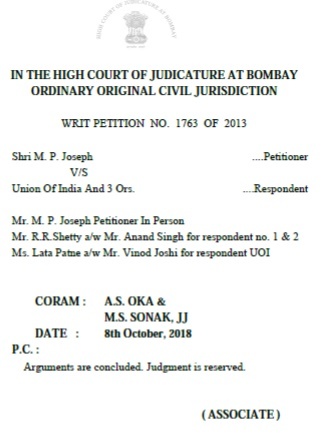 Set aside the Judgment and Order dated 16/04/2013 on ORIGINAL APPLICATION NO.145 of 2013 by the Learned Central Administrative Tribunal, Bombay Bench at Mumbai, annexed as Ex.A, as it is not based on facts and law. ii. Declare partially Para 9 or entire Office Memorandum No. 35034/3/2008 – Estt. (D) dated 19.05.2009 issued by DOPT annexed as Ex.B1, changing the effective date from 01/01/2006 to 01/09/2008 as null and void since it is issued without any authority of law. iii. Declare the effective date of MACPs as 01/01/2006 as already fixed by the Government of India i.e., the Employer, in its Government Resolution dated 29/08/2008 annexed as Ex.C and referred herein above. iv. Issue a Writ of Mandamus or any other order to the Respondents to give effect to the above directions within 1 month of the date of decision. v. Cost of this Petition with a direction to debit it from the 3rd Respondent’s Budget, since this petition is thrust upon the Petitioner unnecessarily on reasons mentioned above.